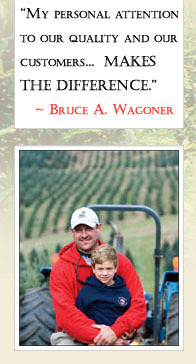 Wagoner's Nursery has recently been featured in several exciting publications! Below you can read excerpts from these articles, or click the link to view the full articles online.
" More than 50 years ago, J.I. Wagoner cut his first old red cedar trees to sell at the Greensboro Farmers' Curb Market. He'd be amazed at what his grandson has done with Wagoner's Nursery, LLC. Today, Bruce Wagoner harvests 275 acres of trees in Alleghany County and ships them from his farm in Sparta all over the Eastern United States. " " 'Working in a family business is one of the hardest things I have had to do, but I wouldn't want it any other way,' Bruce says...While he loves the job, Bruce doesn't know if he'll still be working with trees at 84. He and Bryan both approach the business a little different from their father who grew up during the Depression and is accustomed to making do with as little as possible. Bruce and Bryan attend trade shows and are always looking for ways to expand."